Intelligent medical software (IMS) EMR software for 1st Providers Choice includes a fully integrated e-prescription module that is designed to improve patient prescription management. IMS’s e-prescription software offers numerous features and modules that streamline prescription management, reduce data entry errors and legibility problems, and increase overall patient safety. Writing prescriptions constitutes one of the largest paper-based processes in the United States. Approximately three billion prescriptions are written annually. Using electronic prescribing software can streamline this process by eliminating the need to manually write prescriptions. Learn about e-prescribing of controlled substances. E-prescribing is simply an electronic way to generate prescriptions through an automated data entry process. It uses e-prescribing software and a transmission network which links to participating pharmacies. E-prescribing has been described as the solution to improving patient safety in addition to reducing medication costs that continue to skyrocket. It is estimated that approximately 7,000 deaths occur each year in the United States due to medication errors. These errors predominantly occur as a result of illegibility in handwritten prescriptions, incorrect diagnosis, and missed drug-drug or drug-allergy reactions. What Are the Benefits of Electronic Prescribing Software With 1st Providers Choice? Clear communication through electronic data entry eliminates confusion caused by illegibility from hand-written prescriptions, decreasing the risk of medication errors and decreasing liability risks. It has been documented that medication errors are often the result of inadequate access to current drug reference information. For this reason, our software is equipped with warning and alert systems at the time of prescribing. E-prescribing software can also integrate with drug reference software programs such as ePocrates Rx Pro and the Physician’s Desk Reference (PDR). Physician offices receive over 150 million callbacks from pharmacies with questions, clarifications, and refill requests. According to an HIMSS article on e-prescribing under Topics and Tools at their website, almost 30% of the 3 billion prescriptions written annually require a callback. This equals 900 million prescription-related telephone calls annually. Medco® Health Solutions, Inc. conducted a survey in 2003 of Boston-area physicians and 88% of those surveyed said they, or their staff, spend almost one-third of their time responding to phone calls from pharmacies regarding prescriptions. Medco reported that one practitioner in the survey indicated that, in a time study of his four-physician practice, the average phone call between a pharmacist and practitioner lasted eight minutes and was costing his practice more than $200 per week in wasted staff time. E-prescribing capabilities eliminate the need for time-consuming, manual processes such as fax communication. E-prescribing allows for the complete automation of refill authorization and refills can usually be generated in one click. The pharmacist generates a refill request/authorization that is delivered through the network to the provider’s system, the provider then reviews the request, approves or denies the refill, and the pharmacy system is immediately updated. It is estimated that 20% of paper-based prescription orders go unfilled by the patient. E-prescribing systems expedite the filling of prescriptions at the pharmacy and drug literature can be printed for patients as well. By checking with healthcare formularies at the point-of-care, generic substitutions, and generic first-line therapy choices are encouraged. This reduces patient costs and improves the patient experience. Reduces patient trips to the pharmacy, reducing wait times and improving the patient experience. When using a wireless network, providers have full mobility with our EHR software. This allows physicians to write or authorize prescriptions anytime, anywhere. 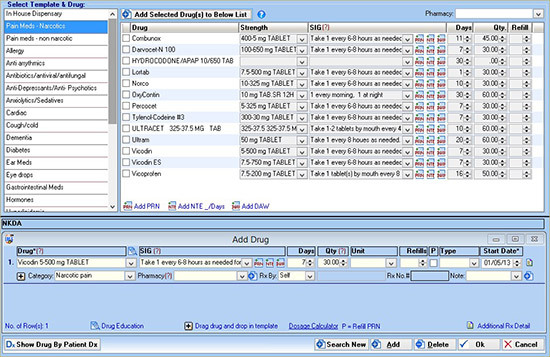 With the use of electronic prescribing software, you can perform query reporting. This action would be impossible using a paper prescription system. Common examples of such reporting would include finding all patients who have had a particular medication prescribed to them during a drug recall, or the frequency of which a specific medication was prescribed by certain providers, etc. To learn more about how e-prescribing software can increase patient safety, help you achieve better value-based care, and streamline office tasks, contact us online or call us at 480-782-1116.